"The force is strong with this one"
Sometimes we need to use temporary tables to do aggregations, joins or to simplify the job. SQL Server supports a number of options that you can use to store data temporarily. You can use temporary tables and table variables, before we start with codes we need know some concepts. Local temporary tables are named with a single number sign as a prefix; for example, #T1. They are visible only to the session that created them. Different sessions can actually create temporary tables with the same name, and each session will see only its own table. Behind the scenes, SQL Server adds unique suffixes to make the names unique in the database, but this is transparent to the sessions. Local temporary tables are visible throughout the level that created them, across batches, and in all inner levels of the call stack. So if you create a temporary table in a specific level in your code and then execute a dynamic batch or a stored procedure, the inner batch can access the temporary table. If you don’t drop the temporary table explicitly, it is destroyed when the level that created it terminates. Global temporary tables are named with two number signs as a prefix; for example, ##T1. They are visible to all sessions. They are destroyed when the session that created them terminates and there are no active references to them. Table variables are declared, as opposed to being created. They are named with the at sign (@) as a prefix; for example, @T1. They are visible only to the batch that declared them and are destroyed automatically at the end of the batch. They are not visible across batches in the same level, and are also not visible to inner levels in the call stack. 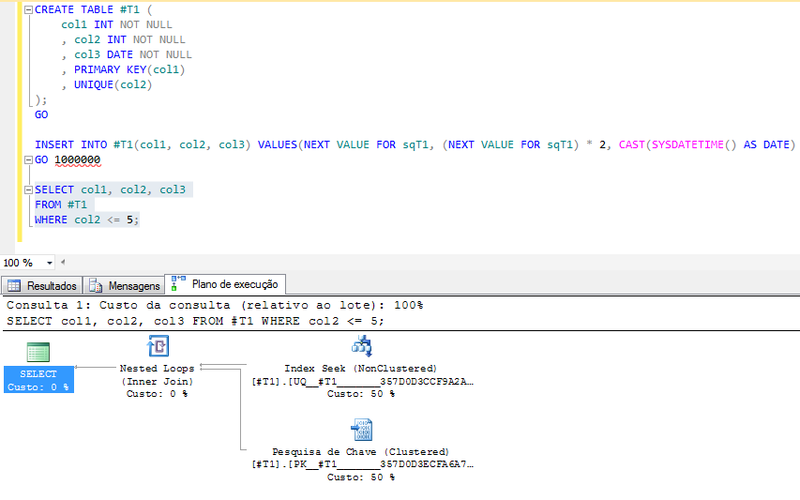 Temporary tables are created in tempdb in the dbo schema. As already mentioned, you can create two temporary tables with the same name in different sessions, because SQL Server internally adds a unique suffix to each. But if you create temporary tables in different sessions with the same constraint name, only one will be created and the other attempts will fail. There’s a common misconception that only temporary tables have a physical representation in tempdb and that table variables reside only in memory. This isn’t true. Both temporary tables and table variables have a physical representation in tempdb. You can find entries in the sys.objects view for the internal tables that SQL Server creates in tempdb to implement your temporary tables and table variables. 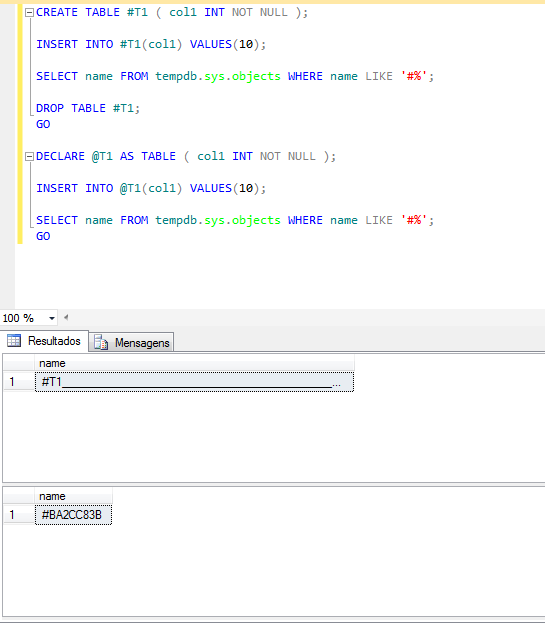 As an example, the following code creates a temporary table called #T1 and then queries the sys.objects view in tempdb looking for table names starting with #. 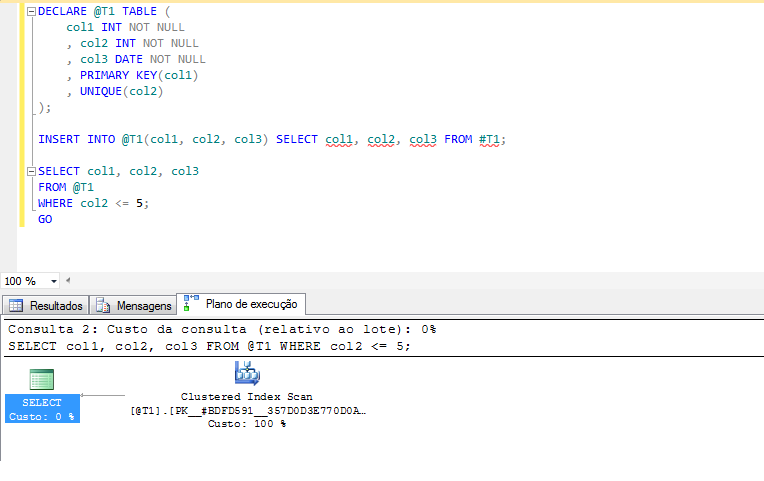 As we can see, both the variable as a temporary table are created implicitly and explicitly in tempdb. So when should I use one or the other? When it comes to performance, there’s a very important difference between temporary tables and table variables. SQL Server maintains distribution statistics (histograms) for temporary tables but not for table variables. This means that, generally speaking, you tend to get more optimal plans for temporary tables. This comes at the cost of maintaining histograms, and at the cost of recompilations that are associated with histogram refreshes. This plan is very efficient. The optimizer examined the histogram on col2 and estimated that a very small number of rows are supposed to be filtered. The plan decided to use the index on col2 because the filter is very selective. Only a small number of key lookups are required to obtain the respective data rows. For such a selective filter, this plan is preferable to one that does a full clustered index scan. Unlike with temporary tables, SQL Server doesn’t maintain histograms for table variables. Not being able to accurately estimate the selectivity of the filter, the optimizer relies on hardcoded estimates that assume fairly low selectivity (30 percent). It just doesn’t realize that the filter is actually very selective, and that a plan more similar to the one shown earlier in the temporary table would have been much more efficient. A common question is whether table expressions such as common table expressions (CTEs) also get persisted like temporary tables and table variables. The answer is no. When SQL Server optimizes a query against a table expression, it unnests the inner query’s logic and interacts directly with the underlying tables. This means that unlike temporary tables and table variables, table expressions have no physical side to them.